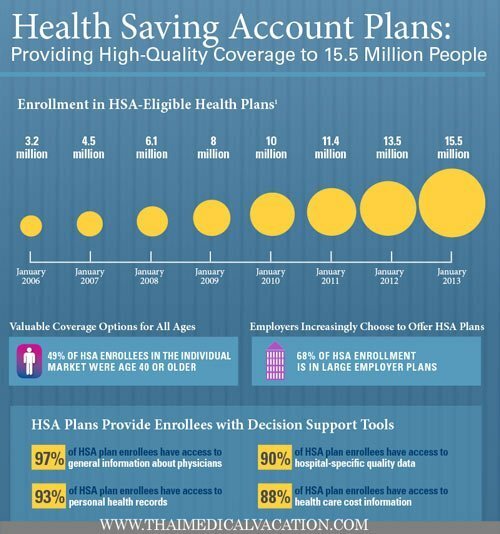 HSA’s or Health Savings Accounts and Flexible Spending Accounts are available to Residents of the United States as a financial vehicle to offset out of pocket expenses in healthcare with tax benefits. A HSA can be used to pay for some medical expenses even if associated with traveling to Thailand as long as the purpose of the trip is to seek out medical care or a very specific medical procedure. Every year, millions of people travel to Thailand for the sole purpose of healthcare. Some patients from abroad do qualify for medical insurance benefits to be used at one of our accredited hospitals in Bangkok. Often times for elective treatments such as cosmetic surgery Insurance may not cover it.But what if you could use a savings account to save money and choose to go where ever you want including Thailand? For people who prefer flexibility to choose their own healthcare provider there is a special program just for you. The good news is that you can now enjoy the benefits of high quality and affordable health care without expensive premiums that only benefit insurance companies. The purpose of having an HSA is for you to use just in case you need or want to get certain treatments based on a cash price. This type of savings account is really useful especially when you are traveling to a country like Thailand. When you are ready to undergo the treatment of your choice you can withdraw your money from the HSA account tax free. This can definitely save you a lot of money. Managing your own health and wellbeing is important and HSA’s make it easy to get the treatment you want for a reasonable price without all the hassles and red tape of standard insurance policies. Its your money and you have the right to make your own choices about health care. Based on US Tax laws Section 213 (d) of the Internal Revenue Code, medical procedures and treatments that qualify are those treatments needed to treat a particular medical condition. For a comprehensive set of information and for complete details, it is strongly suggested that you have access to IRS Publication 502. You can also contact a local tax expert to help assist you in this potential option to get treated overseas. In a nutshell, eligible medical expenses include costs that you incur for the diagnosis and treatment of a particular disease. Expenses incurred in lieu of having a severe medical condition also qualify. Cosmetic procedures like hair transplant, facelifts and breast augmentation are not covered unless the surgery is needed for reconstruction purposes such as the stem cell breast reconstruction after breast cancer or mastectomy. The following lists is strictly intended to be used as a quick reference only. Please note Thai Medical Vacation cannot provide tax advice for your needs. Please refer to link above for IRS Publication 502. Always discuss any tax strategies with your tax preparer, accountant or financial advisor. To avoid incurring high out of pocket expenses make sure that you speak to your tax advisor to see how you can create you own HSA plan. To learn more about using your Health Savings Account in Bangkok or Phuket Thailand please contact us today.